With its vast blue skies, breathtaking surroundings, and nature in all its resplendent glory, Fox Acres is the perfect wedding venue for those who deserve nothing but the very finest for this special day in their life. The serenity of its pristine environs provides Fox Acres the exclusivity that you are looking for in a wedding venue. From its stunning 18-hole golf course, to the 15 abundant lakes, to its award winning fine dining, Fox Acres has it all to provide a spectacular and luxurious experience to your valued guests. In addition to an exceptional cuisine, Fox Acres is equally known for its outstanding facilities and impeccable event coordination to ensure the success of your wedding. The menus can be custom designed to suit your budget and the scale of your wedding. There is a customized solution available to all your wedding venue needs to make your special event perfectly memorable. Designed by John Cochran, Fox Acres offers one of Colorado's finest golf courses at 8,300 ft. above sea level. With an awe-inspiring driving range and 460 acres of pristine nature and holes with names like “Moose Crossing”, “Sleeping Elephants”, “Black Bear” and “Fox Den”, that provide several elevation changes, and over 100 sand traps, the course is designed to serve as a scenic backdrop for your wedding. The shimmering mountain lakes at Fox Acres offer some of Northern Colorado's best trout fishing. Although membership is required to fish the 15 lakes, if you are renting a home within the area, you can have access to the lakes for fishing. Most of the lakes have plenty of large rainbow, brown, and brook trout. Fly fishing is just the beginning, and Fox Acres offers countless fun activities. Fun and adventure is always in the air at this unique and remarkable venue for a wedding. The “Club Rooms” at Fox Acres have been refreshed with many upgrades such as new paint, carpeting, curtains, tile work, bedding, and flat screen TVs. The newly renovated club house offers exotic views of the surroundings. Fox Acres’ 460 expansive acres offer endless summer activities for your wedding guests, if they plan an extended stay. Choose from golf, mountain biking, hiking, tennis, and of course, the fabulous outdoor workout stations. 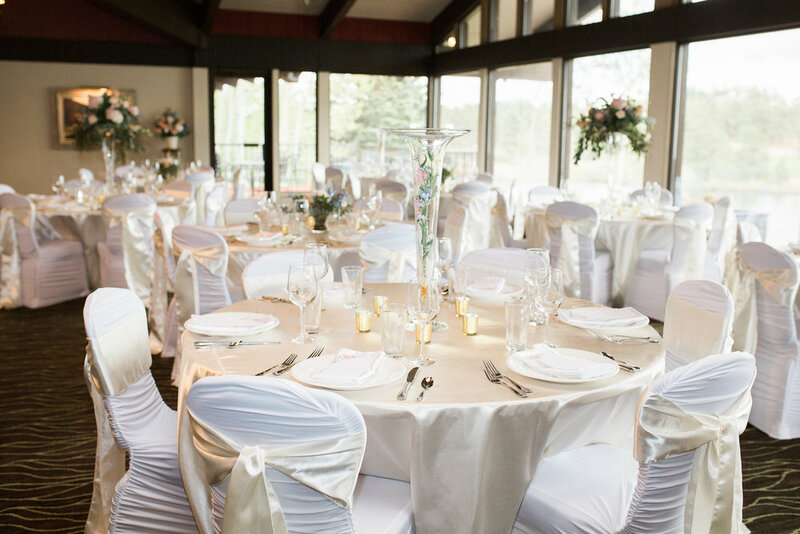 With the capacity to accommodate a fairly large guest list, Fox Acres has so much to offer as a wedding venue. Whether you have planned your wedding ceremony for the morning hours, or during one of the captivating sunsets, there will be no dearth of stunning locations to capture the priceless moments of your special occasion. If you are ready to celebrate your romance in Northern Colorado, Fox Acres is ready with a wedding venue you and your guests will forever cherish.